Socrates Says YES; Aristotle NO – …And the Truth Shall Set You Free. This is one of my personal favorite artworks done by Nancy Rourke. I am a proud owner of this work. In this painting, there are two philosophers, Socrates and Aristotle. Socrates is seen with a sign “YES” and Aristotle’s sign “NO”! According to Plato’s book, Cratylus, Socrates knew that Deaf people have intelligence while Aristotle disagreed. Evidently Aristotle had a lot of issues to be done in order to make it so that the Deaf people are exploited in social media by portraying and seeing the Deaf as unequal to individuals who are not Deaf. Being exposed to falsehoods, Aristotle made the world become aware that even with vast improvements in rights and advantages that the Deaf people entertaining, there is still a negative mentality that has not been eliminated from the Deaf. Particularly, the belief that is held Deaf people are in some ways broken and need to be either assimilated or overcame with what is “ailing” them. They must be accepted into society by viewing themselves as “normal hearing people.” I have become more and more conscious of this fact that, with the visual nature of the state of being Deaf, it has become too easy for many people to view deafness merely as a puzzle piece that is being put into the world and to think that the puzzle piece shows an entire picture of a whole person. So they are trying to hammer out, to interlock edges of the puzzle of into the picture without considering Deaf people do not fit the puzzle piece for an obvious reason. Humans tend to view most groups in stereotypes until they get to know them better. Some Deaf people within the groups represent a certain variation in population. Social media about Deaf people serves to introduce to these groups, and more often that not, this introduction perpetuates in an excessive exploitation. Once we start seeing a Deaf president, a Deaf person dancing, a smart and a successful Deaf corporate executive our views of these groups begin to widen and move beyond the limits of typical. What is simultaneously hard and easy to grasp is that there is more movement to be done. The human consciousness is ready for an expansion and media is calling for it, having been calling it for quite some times. Socrates knew about Deaf people and acknowledged their sign language. Through Plato, Socrates questioned whether Deaf people have intelligence by using sign language. This culture was strong enough to continue Socrates’ legacy. Socrates served more than just encouraged a politically corrected vocabulary. Aristotle offered no apology for the atrocious acts he had committed against Deaf people’s intelligence. He referred to his integrity and principles and admonished his own peers for reserving judgement about the Deaf. His zealous beliefs had since created. Nancy Rourke’s painting was a genius interpretation by looking at these two ancient Greek philosophers because the closer you look at it, there is some assuaging their moral outrage with true feelings of courage of Socrates and remorse of Aristotle. There is no real remorse as Aristotle believed that he was committed to a higher cause. In this sense, Plato cautioned his readers about Socrates’ “enlightenment” and revolutionary ideas when the outcome of such transcendence was bloodshed without culpability in the name of the Deaf. Socrates fought, protect and uphold the human rights of using sign language for Deaf people very seriously and also, seek to have Deaf people to proclaim a triumphant “YES” to human prosperity, knowledge, and happiness. Socrates’s simple quote seems to embody a lot that Deaf people seems to be seeking, which is to be portrayed with a parity that equals the sums of their parts and not in a way that makes them seem lacking or wanting. Socrates is my type of man. 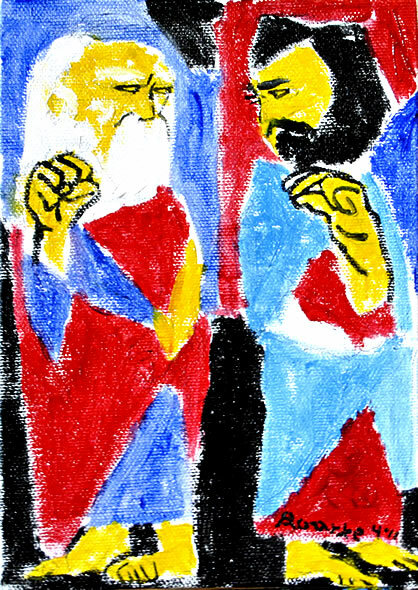 Great blog posting along with the visual display of Nancy Rourke’s “Socrates / Artistole Philosophical Debate artwork! Very impressive artwork collection of Deaf artists, too! Have your artwork collection been displayed yet at Gallaudet ? I don’t believe that Aristotle was a philosopher in a true sense. He was a soothsayer. He talked too much, so only some of them happened to be right. Either him or Pluto actually quoted “If you can’t hear, then you can’t think.” I should have laughed so hard at his stupidity, but I didn’t laugh, because it’s sad that many ignorant like him run the world. Many college professors, sadly, revered them to have bad influence on the society. Yeah, I know what you mean by that! I am not a huge fan of Aristotle’s work. There is a famous painting by Raphael called “School of Athens” with many philosophers in there. Interesting perspective! It was Thomas Aquinas who found Aristotle’s work in 12th century and that is how stupidity towards Deaf people been targeted ever since because Aristotle’s work was actually buried and hidden for so many centuries until Aquinas broke the can of worms. By the way, it is not Pluto, it’s Plato.